So, why doesn’t the Bible tell us more about the early life of Jesus? Why aren’t their more details about the most interesting Person in human history? Maybe we were supposed to use our imagination. 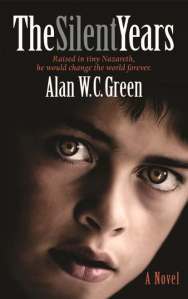 In the tradition of Anne Rice (Christ the Lord: Out of Egypt), Walter Wangerin (Jesus), and many others, Green applies his background as a historian and creatively weaves a plausible story of the ‘unwritten’ experiences of Jesus. The Silent Years is an account of Jesus’ life as told from the perspective of his uncle, Benaiah bar Jabez. This novel is a unforgettable page turner, not simply because of our natural curiosity about Jesus, but also because of Green’s writing style and storytelling ability. The reader will encounter surprising and dramatic twists and turns, challenging theological extrapolations, and curious relationships – all of which bring to life the Son of Man. If you belong to a book club, this novel would most likely elicit a fascinating discussion and ought to be first on your reading list for the New Year. Many of my long held notions of ‘church’ got slammed in ‘The Tangible Kingdom’, Halter’s previous book written with Matt Smay. In this current book, the author takes us – story by apt story – through the Beatitudes, deepening our understanding of the Christ that must inform the way of church. Halter revisits and explores the context in which our favorite Jesus stories arise, excising our anachronistic retellings that have sanitized the events for modern readers. What we are left with is unexpected Jesus – the ‘forgotten ways’ of the embarrassingly ‘sacrilegious’ Jesus. We can no longer ask ‘how could those folks crucify such a wonderfully kind man like Jesus?’ We know ‘why’. Jesus confounded the religious hierarchy, and religion in general, at every turn. We must, then, ask ourselves ‘why’ he took this approach? Did he have a death wish? Was he simply contrarian by nature? Was he an angry man? Or, was religion so totally contraindicated that he found it essential to diss it every time he spoke? Do we ‘get’ what Jesus was doing? Or, have we so preferentially focused on the ‘happy’ stories that we have missed the salient point of his gospel? Halter cleverly illustrated the sacrilegious Jesus through his own ever-so-shockingly, sacrilegious stories. What kind of pastor would return the middle-finger gesture to a neighbor anyways? If Halter is correct, we have re-created Jesus – whether unwittingly or intentionally – into someone who would have been unrecognizable in his time. ‘Our’ Jesus, is not the ‘Jesus’ of history. He is not the person we have imagined him to be, thus we – the church – are not, cannot be, the ‘body’ of Christ we must be. For many, chapter after chapter of this book will relentlessly yank them beyond long established and acceptable understandings of what it means to be the church and a follower of Jesus. Yet, for some, while one chapter will elicit a joyful applause, the next will seem to inadequately apply the lessons gleaned from the first. Though a well-written book with many much needed insights for the 21st century church, there are, in my opinion, several disappointing paradigmatic inconsistencies not uncommon within this genre of books. This suggests that we are in a transitional period in which there are few spiritual ‘futurists’ among us. Your response, as always, will depend upon where you are in your own personal faith journey. Merely dusting around the edges of religion is pointless. True reformers turn things upside down and inside out or more. One doesn’t have to read very far in the gospels to imagine how Jesus’ words seemed to ”torch’ the very foundations of religion in his day. We need not fear finding ‘nothing’ behind the ripped veil if nothing was ever there to begin with. We ought to fear holding on to ‘nothing’ as if it were ‘something’. If ‘something’ is true, it can withstand the intensity of a ‘pyro-provocateur’ – such as Peter Rollins. Rollins doesn’t disappoint. Between the covers of this book we are led into furnace made seven time hotter than ever before. Every diversion from loving grace is torched. But wait, as we exit the last chapter we discover not even one scorched hair or singed corner of our clothing. We look beside us and all that stands with us is one like the Son of Man – for God so ‘loved’ the world that he sent ‘love’ in human form. It turns out that Christianity was really all about Christ after all. Funny thing, that, eh? Based on Pete’s earlier book, “How (not)”, I understand him to say ‘we can’t help but speak’, while in “Insurrection” Pete seems to move the conversation into the 2nd naivete – without dismissing the first – suggesting ‘we can’t help but love’. In the ‘aftermath of God’ we unabashedly ‘must’ interpret, yet eventually, frustrated with the inadequacy of words, we are compelled to find peace with the Ineffable through and by love. 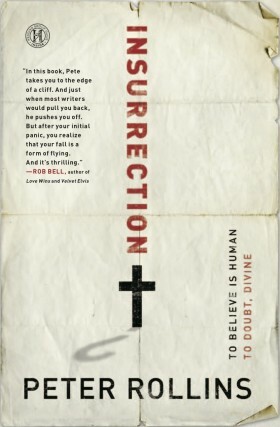 Rollins reminds us that the intentional deconstruction of religion is not to destroy faith. Yet, after several millennia of religion it is nearly impossible to discern the heart of faith without a ‘fire’ sufficient to burn away all dross that has, through the centuries, unwittingly made ‘object’ more ‘sacred’ than the Subject. That which is most precious must die before it can produce the truly precious – love. If this is your first encounter with Pete Rollins, you might consider beginning this delightful journey with his first book – ‘How (not) to Speak of God, followed by his second, ‘The Fidelity of Betrayal‘. Both of these books form a useful foundation for Insurrection, Peter’s latest book.